The Green Arts Conference, is the annual conference on how and why Scotland’s cultural sector is creatively approaching environmental sustainability. It is an opportunity for the sector to highlight and share the innovative steps being taken to reduce its environmental impact and to discuss the challenge of how the arts can contribute to a more sustainable Scotland. 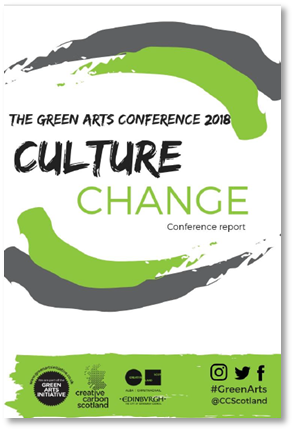 The Green Arts Conference 2018: Culture Change in November 2018 was a sold-out event – our biggest one yet – with over 150 participants from across Scotland’s cultural sector and beyond: both the sector and the country! Do you want to be part of a future event – either as a Green Arts community session speaker, or as one of our sustainable suppliers? Or do you have ideas about content, location or structure for the Green Arts Conference? Get in touch with Catriona.patterson@creativecarbonscotland.com. With a specific ‘spotlight’ on the knowledge, learning and skills that Green Champions and their cultural sector colleagues need in their roles, the conferences are a mix of plenary talks, interactive workshops and facilitated networking, all with the aim of growing internal confidence and external prominence of the work of the sector.